3D printed architecture designs are becoming more and more common. This is thanks to 3D technologies, which has given us the opportunity to create complex structures faster and at a lower cost. It is for this reason that many companies feel an attraction to 3D printed architecture. It is also one of the reasons why we have seen so many innovations in 3D technologies. Therefore, our goal today is to show you some of the global projects that have already been created or are currently being developed using 3D technologies. Giving you a quick peak you at the potential of 3D technology today in the fields of architecture blended with art. 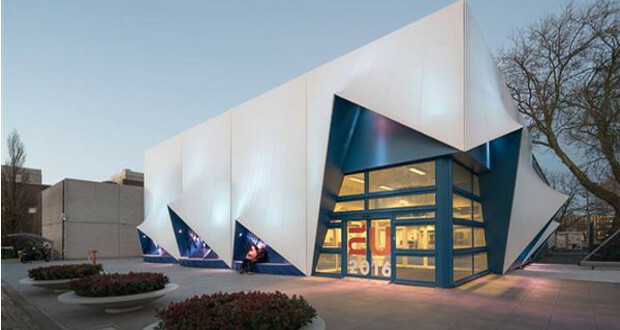 The European Union is no stranger to making innovative decisions, so it comes as no surprise that during presidency of the European Council by the Netherlands, they decided to create their gathering building, the ‘Europe Building’, using 3D printing. Designed by DUS Architects, the shape of the building was reminiscent of a sailing boat, with a large sail draped over the building. 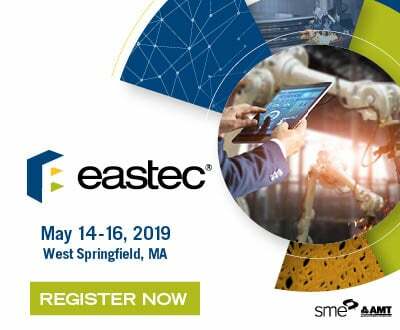 The project itself was developed alongside: Actual, Neptunes, TenTech, and Henkel, a multinational company that is known for their innovative work with different materials. Using XXL 3D printers and FDM technology to produce the building and a special bio-plastic that was developed specifically for this project, they were able to show just what 3D printing can offer to the world of architecture. Although this building was dismantled in July of 2016, many people were able to observe and walk through the structure until its deconstruction. 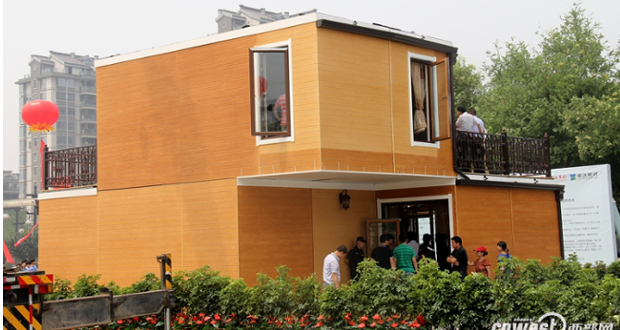 The Chinese construction company, ZhuoDa Group, has found a way to 3D print a two-story villa in only 3 hours, creating the home of your dreams with the press of a button. Using a large 3D printer, they create six 3D printed modules that are fireproof and can withstand a magnitude-9 earthquake, thanks to a secret material that is sourced from industrial and agricultural waste. After, the modules are pieced together like Legos to create the villa. By completing 90% of the construction off-site and shipping the pieces to the installation site, they were able to dramatically reduce construction costs, with each home costing between $400 and $480 per square foot! With the overall time between printing and assembly only being around 10 days, it is safe to say that this is a big architectural innovation that we hope to see more of in the future! 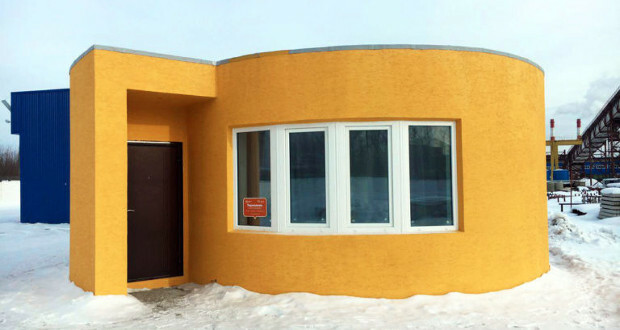 Earlier this year, Apis Cor, a Russian manufacturer of 3D printers, brought us a new way to look at 3D printed architecture with a home that is 3D printed in only 24 hours. Designed to be a fully functioning, low cost home, Apis Cor’s design includes a flat roof that can support heavy snowfall and solid plates that isolate the entire structure. This gives it overall protection from the elements. By teaming up with Samsung, the company provided different appliances that furnished the house to show just how functional the home is. As a top supporter of 3D printing, with many other 3D printed buildings in the works (such as their 3D printed high-rise), the United Arab Emirates decided in 2015 to showcase this support by 3D printing an office building. Thus solidifying their commitment to 3D technology and innovation within the UAE. Created under Dubai’s 3D Printing Strategy, this building has 2,700 Square feet of space and has a cost of about $140,000. Using mobile printers and a special mixture of cement and building materials that were designed and made in the UAE and the United States, the building only took 17 days to print and was installed on site in 2 days. The building itself totes an arc shape to ensure stability and safety, innovative features to reduce energy consumption, and the latest technologies for the management of information systems within the building. This temporary, hive shaped, cabin was built to provide quick, affrodable accomodation to the citizens of Amsterdam. 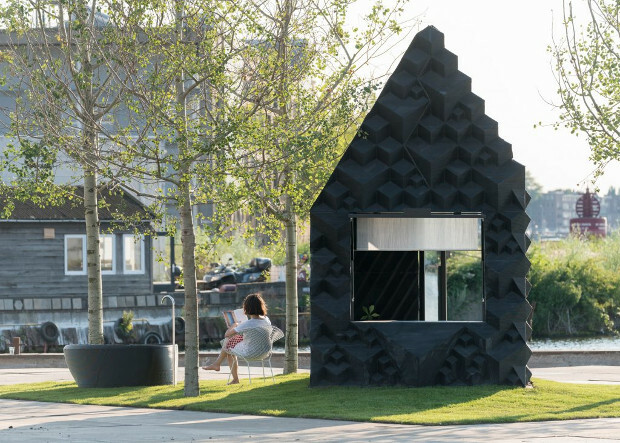 Placed in the heart of the Dutch Captial by DUS Architects, this cabin was created using recyclable thermoplastic that was 3D printed using the KamerMaker, a 3D printer that was installed in a giant container that reaches more than 9 ft high. The cabin itself is 86 square feet and can accommodate up to one person. Included in the cabin is a bathtub and 3D printed shelves. 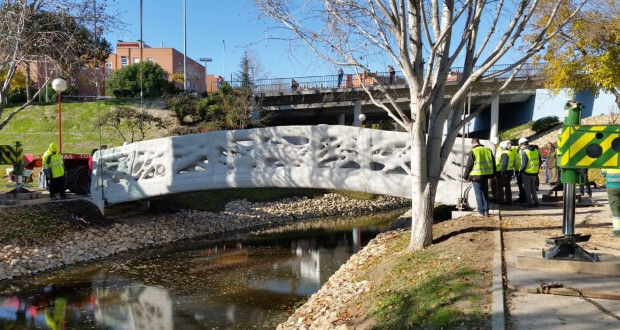 In the Castilla la Mancha park, to the north of Madrid, a company called Acciona has 3D printed a concrete bridge that reaches 40 ft long and 7 ft wide. Through a new initiative in this Spanish city, they have been able to blend the structure into the surrounding settings of the park. Using 3D printing, they were able to create a customizable bridge that mimics nature, while greatly reducing the construction costs and time needed to complete it. The concrete structure offers high strength, while maintaining a complex and original architectural design. Dassault Systems and the French startup XTreeE have come together to design a unique 3D printed pavilion. Unveiled at the headquarters of the French giant in Vélizy-Villacoublay, the structure of the pavilion takes the form of a coffee bean, while the walls were inspired by forests. By using a cement material that was developed by LafargeHolcim that is 6 to 8 times stronger than traditional cement, means that this pavilion is stronger than many other pavilions. XTreeE used robots from the Swiss brand ABB to control printing more optimally to optimize the amount of material used. In only one operation they were able to print the roof, an integrated bench and the walls. The Dutch company MX3D and the Dutch designer Joris Laarman have been commissioned to design a steel footbridge in the historic center of Amsterdam. 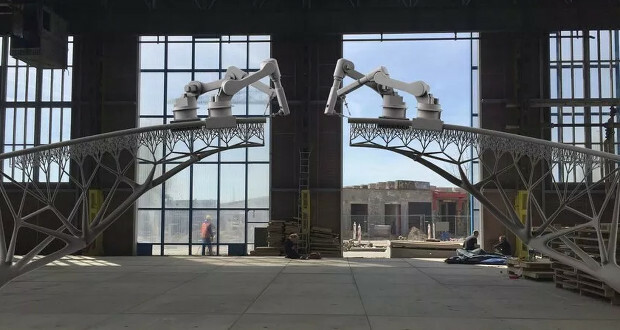 The bridge, whose construction is expected to be finished soon, was created thanks to the MX3D metal printer, which can deposit steel rods thanks to its multi-axis mechanical arm. By using this manufacturing method, the Dutch company is able to create a more complex structure in an easier, and time saving fashion. This project also benefits from several renowned partners such as Lenovo and Air Liquide, who contributed their expertise to the R&D portion and supplied the welding gases. The Italian company WASP is a company known for their promotion of more sustainable projects that are related to 3D printing. After signing an agreement almost a year ago with an Italian province to create the first eco-village, the village of Shambhala was finally born, the first to be built completely using 3D technologies. 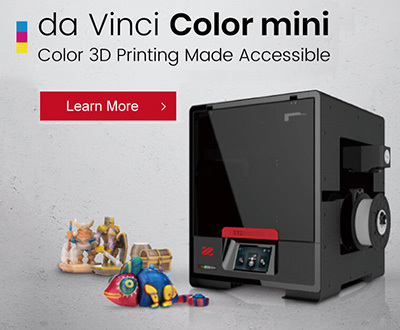 Using the Big Delta, one of the largest printers in the world, they were able to bring this remarkable project together by 3D printing with cement. Today, WASP has mentioned their continue effort to bring future developments to Shambhala through 3D printing in their laboratory. 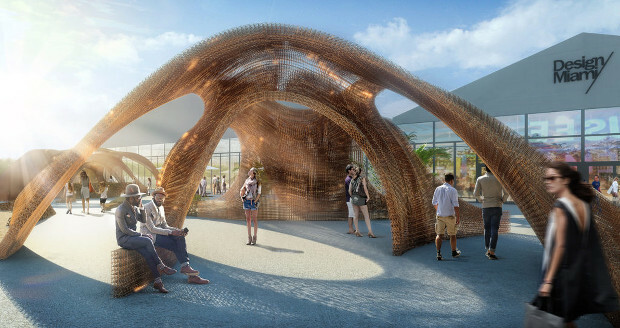 The architectural firm SHoP began the development of what will be the largest architectural piece in the world created with 3D printing technology in the city of Miami, Florida. In order to develop this pavilion, SHoP collaborated with the French company ‘Drawn’, who has previously worked with Kuka, a robotic arm that features an extrusion head that allows for the creation of complex shapes. The pavilion will be created using a bamboo-based material making the pavilion sustainable, and will have an area of 1,765 square feet. This will allow them to break the Guinness World Record as the largest of its kind. 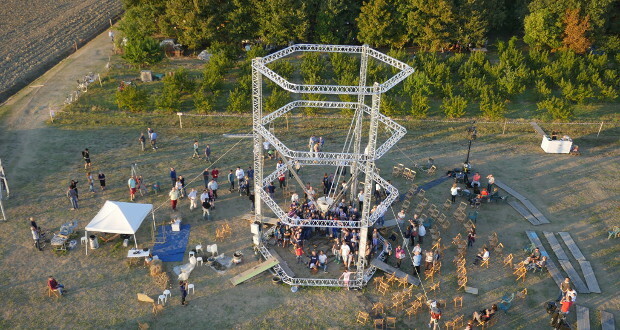 The first skyscraper to be created using additive manufacturing technologies is becoming a reality, thanks to a project in cooperation with Aleksandar Grusanovic called “The Tower of Babel”, which will reach 2,460 ft high. This project is aiming to be one of the most ambitious projects relating to both 3D printing and architecture. The company in charge of the project will be Cazza Construction, the same company who will be in charge of creating 25% of the buildings in Dubai over the coming years. Belatchew Labs, an architectural firm of Swedish origin, specializes in the development of experimental and visionary projects to help bring improvements and innovations for the future. 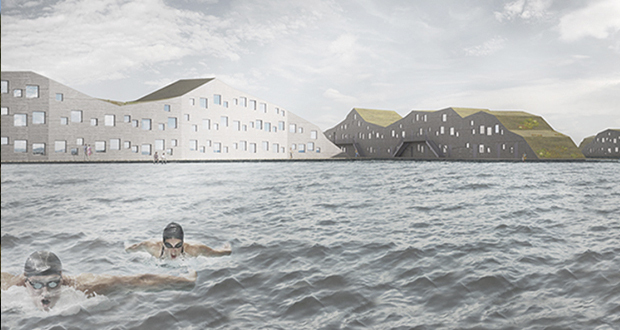 To help accomplish this goal, they have created SwimCity, a villa to help increase the supply of housing for young people through sustainable living on water. To help bring their project to life, they have received support from the Swedish National Board of Housing for the construction and planning. 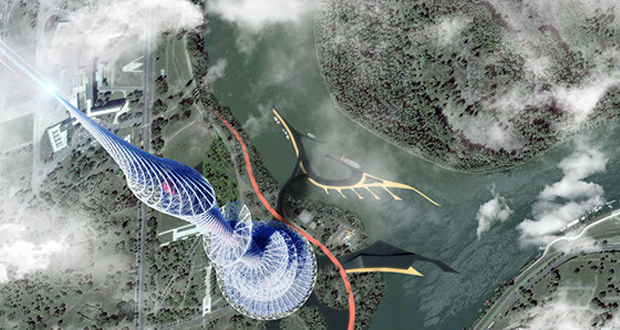 This city of the future proposes a new space that is sustainable and has a geometric design that is sure to grab the attention of young adults. 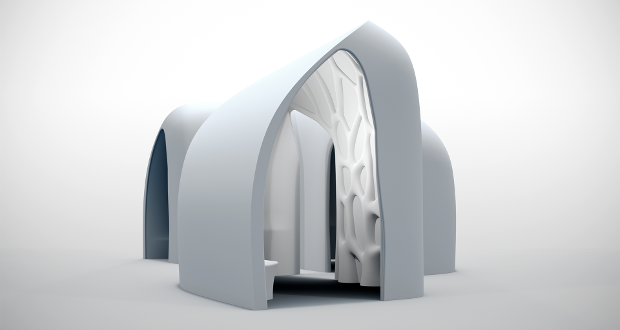 What do you think of these 3D printed architecture designs? Do you think we’ll see even more 3D printing in architecture in the future? Let us know in a comment below or on our Facebook and Twitter page!